I have made big moves in my life. I leapt from Philadelphia to Hawaii on a whim. A year later I packed my bags and headed to LA. Both of those decisions were seemingly spontaneous, but in hindsight I realize I actually got a clear YES each time. I just wasn’t very conscious of it at the time. Your ability to hear your yes comes from your connection to your intuition. Breathwork is one of the best ways I know to develop your intuition. It's something that started to happen naturally when I began my practice several years ago, but more recently I've been consciously working to fine tune it. The process is sometimes painful, draining, and requires commitment and effort. It means I have to be really gentle with myself as I move through some of the murky waters. I have to watch out for my old stories, see the fear that is keeping me stuck, and choose to love myself instead. It's also a thrilling process. I get to play detective, stopping mid sentence to acknowledge the chills running up my legs when I read something that resonates as truth. I notice when my heart opens and it feels like I want to laugh and cry at the same time. I begin to ask the Universe to support me and experience it responding. Working with your intuition means paying attention to both the yeses and the nos. Back in December I received an incredibly clear YES to write a book about my process healing from a devastating breakup that had happened at the top of the year. Less than two weeks later the short book was on printed paper, and the hard work of editing began. Over the past three months I've healed immensely through working on this book. Some of it has been horribly painful, and the process has taught me so much about myself. I’m currently in the final phases and have been struggling to complete it because of my schedule. I've been fantasizing about heading into the desert to spend some quality time with the book. The story in my mind goes something like this, "Aw man, it would be so nice if I could just be somewhere off-the-grid, all alone, and finish the book. Too bad I have too much on my plate right now to do that." Our minds and the stories we decide upon limit us. The Universe is full of infinite potential. If you connect to that place you become a sliver of unlimited potential, and then you are open to all the possibilities. So without expectation I decide to play around with my schedule and Airbnb availabilities and see if I can make it happen. I find the perfect place in Joshua Tree with just the right window of time for me. It would mean moving some clients around, but it's doable. I feel energy move through my body, so much so that I jump up and down like a little girl giddy with excitement. This is a clear YES! The yes my friend was talking about. I am seeing it, feeling it, and acknowledging it. So I go to Airbnb to book the place when I notice that one of the nights smack in the middle of my stay was listed at $999. In a split second I feel the stories start again. Do I really need to go to Joshua Tree to finish my book? Can’t I hole up in my apartment for a few days and save some money? Am I being financially irresponsible by spending hundreds of dollars to finish this book that I’m not being paid to write? I close my laptop and decide it isn't in the cards for me this time. I just have to grind it out on weekends like I've been doing for the past three months. It will get done. The next day I wake up reflecting on my intuition. I recognize that I was getting clear signs to follow. If I choose yes I am telling the Universe that I’m here showing up. I’m listening. I’m honoring what wants to come through me. I’m declaring that this book is important enough to make the effort to go to Joshua Tree, to clear things out, to spend the money. I come back to the choice to follow the yes or to live in the old story that keeps me small. I move back into the realm of possibility. I imagine myself writing there and finishing my book. I feel myself committed to something that is really important to me and honoring the message the Universe has given me that this book is the one I need to send out into the world. If I choose no I am aligning with the story that I’m not supported, that I’m not worthy of taking this time off, that this writing that is coming through me isn’t that important. I email the owner of the property about the strange pricing, he adjusts it, and I book my trip. Even as I type this now I can feel the energy and excitement in my body. 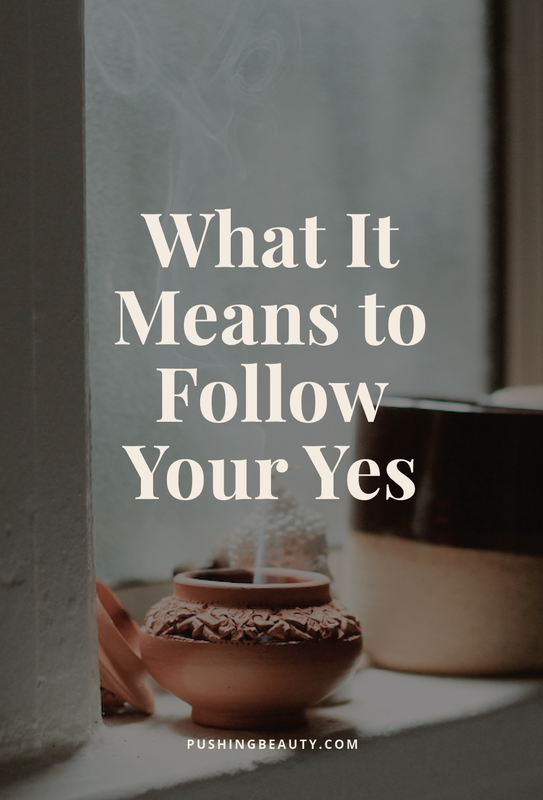 Following your YES will lead you to where you need to go. Your mind might not know where it will lead you, and that's ok. This is what it means to trust, to have faith, and to listen to your intuition. Breathwork is my go-to tool for clearing out old energy and connecting to my intuition. You can start your own practice here. Become mindful of your body in your day-today. Start to feel into when you feel a YES in your body or a NO. Usually a YES feels light and exciting and a NO feels heavy, burdensome, and limiting. Limiting energy is very seductive as you can tell from my story above. It’s really easy to move from feeling the YES to aligning with the story of NO. The more conscious you become of this the easier it will be to see where you’re aligned. When you’re in the NO start to ask yourself what story you’re living in. What are you afraid of? I’d love to hear your stories of Following Your Yes in the comments below!